As I move into the habit of living more intentionally, I like to spend about 10-15 minutes each day on strategy – identify 3 non-negotiables (I have tried 4, 3 and 2 and found 3 to be the magic number – achievable and satisfying) to do each day and have an overview of what’s on my plate. The thing about so doing is that you need to always be in the know about what’s on your plate. I used to depend on memory, but memory has since become unreliable after childbirth. If I strategize at night, I normally don’t have a problem knowing what I need to do, but if I strategize in the morning – the sleep takes away my memory of what’s on the plate. I rely on lists, which I update with urgency once the to-do comes into my mind. For personal use, I do it on evernote, for work, I use an excel sheet (mad love). There is no gain without pain. The initial time investment to note down what’s on the plate can be substantial (more applicable to work for me) but the end results is a system which allows me to be efficient and effective. 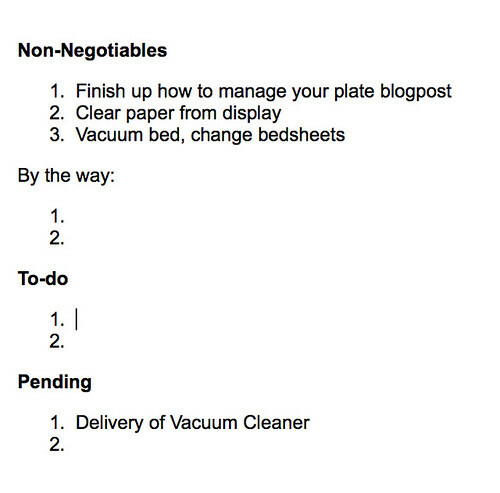 Negotiables which can be done along the way while I do the non-negotiables. For example, If one of my non-negotiables is to buy diapers, other things I can get in the vicinity of the supermarket or mall will be listed under my “By the way” list. Full list of things I need to take action on. In no particular order of importance because I update the list as the to-do crystallises. I pick my non-negotiables from this list. For things that are suspended or pending reply. Usually these are the things that get forgotten over time. You can use any note taking device you are comfortable with – I use evernote because it has bullet functions that are easy to use and I don’t have to care about numbering. It works best electronically because you may have to amend the list over and over again but also do-able with hard copy journals. You can use this to achieve some personal goals systematically like acting on one thing that is necessary each day by listing it under the non-negotiables. I use my list together with google calendar. Together, they are good enough to manage my life. A lot more describing to do because of the nature of my job. I also like to have more data on hand, in the event of dispute or query. I use excel for this and the most important thing to note when setting this up is the headers you use. They should be for information you need to draw out from time to time, or information that will help you in one way or another. It is not always first in first out. Sometimes I prioritise items that are worth more, even if they came in later, sometimes I work on easy to clear ones so that I have more time to deal with the complicated ones. For things that I cannot act on at the moment or things that are awaiting reply. I also use this tab to track things which has a fixed deadline that needs to lapse before I can act on them. Again these are the most easily forgotten things, so I take more care and effort to update. This is just a dump of all the jobs I have completed but with the use of filters, you can get a cool breakdown of all the actions taken on a matter, yours and other’s because I also dump completed “pending” items here. If you noticed, headers used in all of the above categories are kept the same and in the same sequence as much as possible. This reduces my work in updating them – I just copy and paste then update columns that need to be updated. 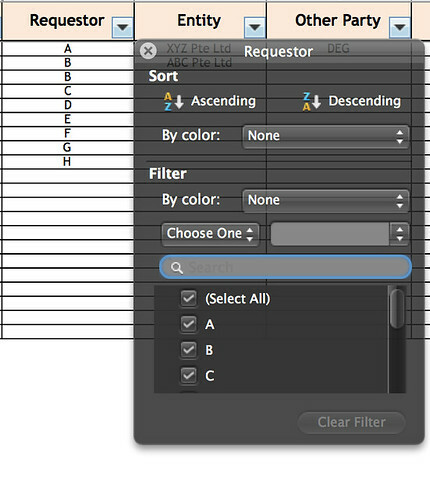 After setting up, apply the filter function and you will have information at your fingertips. I also use simple formulas to help my compute turnaround time or expiry dates easily. Let me know if you try this, better still if you have ideas to improve on it.